Nha Trang Tourism has long been popular with many interesting sights, such as the island with beautiful beaches, pristine, ancient Thap Cham, typical food and sea regions. Travel World Wonder will now introduce to you 10 attractive places in Nha Trang that should not to be missed during your trip. Located on Hon Tre island with crystal clear waters all year round, Vinpearl Land is known as "tropical paradise". 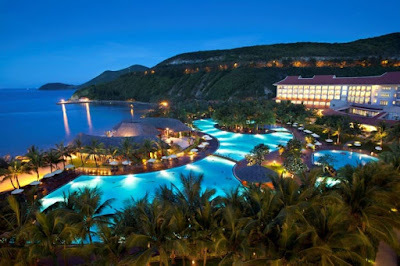 Apart from the luxury hotel, beautiful gardens, ideal freshwater pool, this place also attracts visitors to the area Thrilling game and the spectacular 4D cinema. Tickets to the island including the cable car tickets and playing games are at the cost of 600.000 vnd per adults and 350.000VND per children (1.0m - 1.4m tall). Has an area of of about 110 hectares, from the Nha Trang city go from about 7km to the southeast. From Hon Tam we can see the whole city in the north of Nha Trang and Cam Ranh peninsula in the south. In addition to beautiful beaches, this place is also known for exploring marine activities by glass bottom boat and diving services to view coral. About 60 kilometers away from Nha Trang, it is located on a peninsula named Hon Cat, Ninh Van Bay has a bold and pure untouched beauty. It is particularly suitable for those who want to feel relaxed in the quiet coastal space. Additionally, you can also snorkeling and scuba diving or try surfing, windsurfing, kayaking. Oceanographic Institute was established in 1923, is located at No. 1 Cau Da from downtown Nha Trang about 6km to the southeast. It has over 20,000 specimens of 4,000 types of marine and freshwater organisms were collected and preserved for years. In particular, to the Institute of Oceanography, you will admire the giant whale skeleton near the 26m long, 3m high with 48 vertebrae fully restored.